Here we are, surrounded by pie, coffee and donuts, deep into the mysteries of Twin Peaks, Washington. We've gotten through the pilot episode and are going to marathon through the rest of the first season, if I don't pass out in a diabetic coma first. Still going strong after several pieces of pie, several donuts and two cups of coffee. So let's give this one four jolts of joe out of five and head on to episode 2. 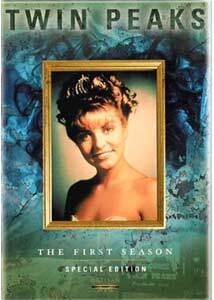 Albert attempts to begin his autopsy of Laura Palmer, but runs up against the desire of the town to bury their homecoming queen. We have probably the wackiest funeral on record as Laura's father completely loses it, and her two boyfriends, Bobby Briggs (Dana Ashbrook) and James Hurley (James Marshall) come to blows. Meanwhile, Laura's identical cousin, Madeleine Ferguson (Sheryl Lee), comes to town in a strange riff on Vertigo and The Patty Duke Show. The pie is huckleberry, a la mode, served with a healthy helping of Jungian analysis. We also get our first impression of some unspeakable evil in the Pacific Northwoods. Well, it's nearly 5:00 PM and the bladder finally gives out. More coffee and more pie is called for, as long as I'm up. In the meantime, a friend has shown up unexpectedly at the door, asks what's showing and is immediately sucked into the well-realized world of Twin Peaks. Time to put another pot of coffee on. Yes, I'm wired. Hoo hah! Four more mugs of mountain grown out of five. Interpersonal relationships also begin to become more complex, as Norma Jennings (Peggy Lipton), owner of the local diner and lover of Big Ed Hurley (Everett McGill), who is husband to Nadine, is confronted with the parole hearing of her own husband. Audrey's affections for Agent Cooper blossom into a concrete effort to assist him, which involves both deceiving and betraying her own father. Fenn pulls this off nicely, uniting the spoiled brat with the lovesick young woman and a sense of determination. The amusing television and movie homages continue, as The Fugitive fans will recognize the humor in a one-armed man named Gerard. Over one pie devoured, and half the donuts are gone. Working on the second pot of coffee, and I'm starting to twitch little and sweat a lot. Three and a half cups of coffee as the mystery develops. All the threads interweave here as we get the grandaddy of all cliffhangers. At least six major plotlines are left in life or death situations. Intrigues, double-crosses and scams come to fruition, and senseless violence and attempted murder are the order of the day. Gunshots, burning buildings, axe attacks and more are all prominently featured. The summer of 1990 was pretty tough to make it through, and the wait for the Season Two discs is going to be just as excruciating. Kyle MacLachlan has one of his best scenes of the series here, masquerading as an oral surgeon at One Eyed Jacks and luring a suspect back across the line to the US. The pain visible in his eyes, fought back by dedication to his job, is superb as he listens to the tale of what happened to Laura on her last night alive. Head writer Mark Frost takes the directorial reins here, and he works surely and swiftly, intercutting the various stories masterfully to weave the climax that tantalized us for many months. A solid five cups of leaded out of five here. This is series television at its finest, good to the last drop. A pie and a half, seven donuts and two pots of coffee later, my heart rate rivals that of a hummingbird, and I may never sleep again. But that's okay, because I'm going to watch the whole season all over again. Image Transfer Review: In contrast to the picture on the pilot, this looks fabulous. Color is vivid (within the paradigm of the warm color schemes used), and is detailed and attractive. Black levels are quite good. Compression artifacts are minimal, despite the heavy use of water imagery. Minor mosquito noise is noted on the end credits, but otherwise the picture looks quite fine indeed. The source print is practically flawless. Audio Transfer Review: Three different English audio tracks are provided, but they only have minor differences. All of them are quite clean and free of hiss, with good directionality. The directional aspect is more evident in the 5.1 tracks. All have significant surround activity and decent bass (though not overpowering as was the case with the import pilot episode). The DTS track is produced at a slightly higher volume, but even after adjusting for this it seems to have a slightly richer midrange and bass. Ambient sound is particularly notable in the later episodes, such as the rainstorm on Episode 6 and the sound of the casino in Episode 7, richly reproduced and highly atmospheric. The soundtracks are all quite well done and will satisfy any fan. Extras Review: This set is chockablock with fine extras. Each episode has its own commentary from the director (except Lynch, who refuses to discuss his work, and Mark Frost). On Lynch's episode, the DP does the commentary, and he does a capable job, giving an artistic and creative overview for the whole series. The commentaries are all knowledgeable and hold the viewer's interest quite well. None of them resort to describing the action onscreen, except in the context of pointing out camera moves or easily missed tidbits. One of the more interesting extras is the option to have an icon appear whenever a deleted or altered scene would appear in the program. When this icon appears, you're taken to one or more screens outlining what was changed or removed. These help to resolve a number of plot points that were just left hanging in the televised version, such as James Hurley's mother, and what's actually behind the "Flesh World" magazine subplot. A very good modern documentary featuring interviews with most of the surviving cast (with the notable exceptions of Boyle and Fenn). For those who don't know the solution to the mystery (revealed in the second season), DO NOT WATCH THE LAST FIVE MINUTES OF THIS DOCUMENTARY. Those who put it together very questionably included a huge spoiler just before the credits roll. This is inexcusable, since there are many potential new fans unfamiliar with the series who might be buying this set. Two little featurettes on the diner location (9m:45s), and how to speak backwards with The Man From Another Place, Michael Anderson, are worthwhile little tidbits as well. A telephone interview with Mark Frost (14m:35s) also provides some interesting background to the series. This interview, as well as the onscreen notes, were provided by the incredibly dedicated fans who put out Wrapped in Plastic magazine, the amazingly still-running periodical devoted to a program off the air for ten years. These are guys who know the series inside and out, and they've got plenty of information to provide. They also offer a 1995 text interview with Sheryl Lee. The Log Lady introductions from the Bravo reruns of the program are included, and optionally can be used to flow into each episode. They're shot on video, though, and look notably worse than the programs themselves. Cryptic in nature, I'm not sure they add a great deal, but getting more glimpses at the world of Twin Peaks is always welcome. Finally, there's a directory of relationships that gives endless details about the characters and their interactions as well as actor filmographies, and it's pretty much spoiler-free. A printed synopsis helps bring things up to speed, but there's really no substitute for watching the pilot episode. How frustrating that Warner wouldn't license it to Artisan for inclusion in this set. Television's most challenging series comes to DVD in a superb special edition. Loaded with goodies, with the participation of not only those involved but also dedicated fanboys of the show, there's practically everything you could want here (given David Lynch's refusal to discuss his work). Now, Warner, where's a nice edition of the original pilot?? ?